The “Spring” weather in Northern Virginia has been overly chilly. We’re at least a month behind last year’s Spring weather arrival. And even though it’s been cold outside, I know I need to address the leaves, acorns, and other debris that have accumulated on the pond netting covers and maybe even sneaked into the ponds. 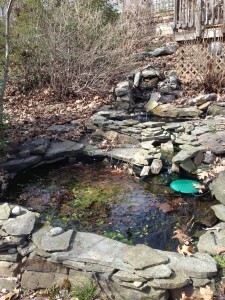 So let me show you how to ready a pond for Spring! 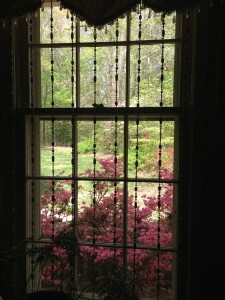 In mid-March of 2012, we had azaleas and wild dogwoods blooming and the daffodils were just finishing up. 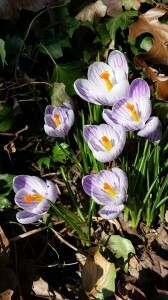 This year, the daffodils just started to bloom at the end of March, and nothing whatsoever is happening with the azaleas or dogwoods. Not even big fat buds ready to pop. Just nothing. Even the famous Washington, DC cherry blossoms have waited to appear, much to the dismay of the tourists. Then over the weekend, it was in the 70s and sunny. The fish were moving around in the ponds. It was a gorgeous day outside on Sunday. While pruning the deadwood out of a few bushes, I’d run into a nice gentleman who recently purchased a home with a koi pond. In our brief initial conversation about the lovely weather, he started to ask questions about ponds. Elated, I took him into my back yard to show him The Ponds Project and answer his questions about how to wake up his own pond this Spring. Since I tend to be a messy gardener, getting mud and dirt (and fish filter water) all over me, I left cleaning the pond pump filters until the end of the day. It’s the first winter that I’ve left the pond pumps on, and let me tell you, the fish have been far healthier and seem to be happier. The water is clearer, too, and the sound of the waterfalls has been very pleasant! I noticed that many birds have visited the ponds over the winter, and seemed more interested in the ponds than my bird feeder! 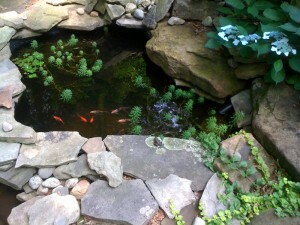 Last fall, I had covered the ponds with a black plastic pond netting (See my posting on Winterizing Your Pond). The covering of pond netting is useful mainly to catch acorns, leaves, and other debris from falling into the ponds and waterfalls. 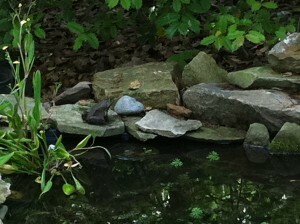 It will also help deter raccoons, predator birds, and other creatures from attacking the pond inhabitants. 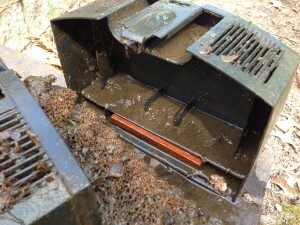 The mesh was full of debris, and I noticed some algae growing in the debris mess. Time for cleanup! 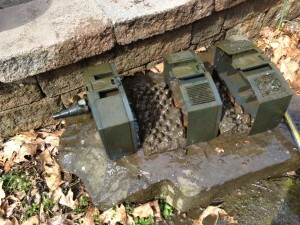 I started the cleanup by removing and cleaning the pump filter units. You may have an exterior filter (outside the pond itself) or a submersible filter which is what I have. I turned off my pumps and pulled out the filters. 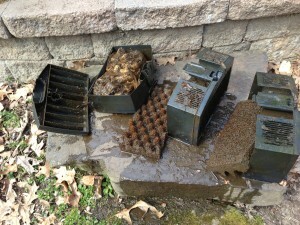 When I opened them up, I was pleased to find just a small amount of waste in the filters. 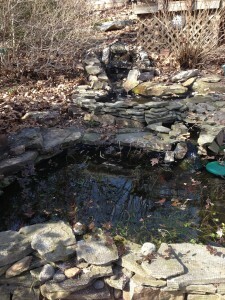 The deeper pond had more waste than the other pond…yet it wasn’t as much as in the summer. 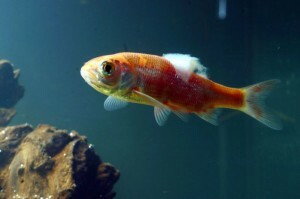 The fish sort of “hibernate” and slow down during the winter when the water cools down so less fish waste is excreted. Experts recommend that you “rinse” the foam filter inserts in pond water. I don’t. We have a water well that pulls fresh and clean water from far beneath the ground on our property. I just use a hose with a strong water stream to rinse the fish waste from the foam filter inserts and return the inserts back to the filter housing. Fish waste is kind of like a “mud” and can be collected in a bucket and used as fertilizer for your bushes and trees. Just add enough water to make a “tea” of fish waste and pour it around the trunks. Your plants will thank you. After cleaning the filter inserts, and putting the filter housing back together, connect it back to the pump and start the pump again. Then, using a large net, you can collect the debris on top of the pond netting. Dispose of the debris. 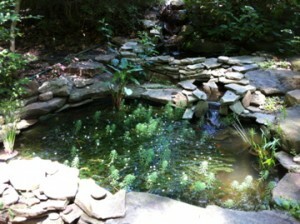 Your pond will look much better! Mine did! I will remove the de-icers after I’m certain that the water won’t freeze again — probably in early May. The next step in pond cleanup for me will be to remove the plastic pond netting. At that point, I will use a large net to scoop up some of the debris that has settled on the bottom of the ponds. Being careful not to pick up fish or tadpoles (I have bullfrog tadpoles that overwintered! 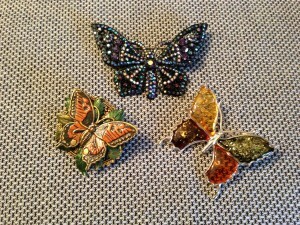 ), I will scoop up and discard the debris. Usually in early May, in the Northeastern US, the frogs will start to lay eggs in the ponds, so be sure to clean up your ponds before then. Otherwise, you might remove any frog eggs. Frogs are one of the best features of a happy pond! You may be wondering, “When should I start to feed my fish?” Not yet. I usually feed my fish from mid-May through mid-October. If you start feeding too early, the fish may become more active, and may develop diseases. Speaking of diseases, at least one of my 100 goldfish that will usually contract a cottony-looking substance on its body. It’s happened every single year, and is attributed to a quick change in water temperature from warm to cool and back as happens in Spring. I use Pimafix to treat the fish. Within a week of treatment, the disease will usually subside. The medication won’t hurt the other fish, and helps to protect the pond from further antifungal disease. 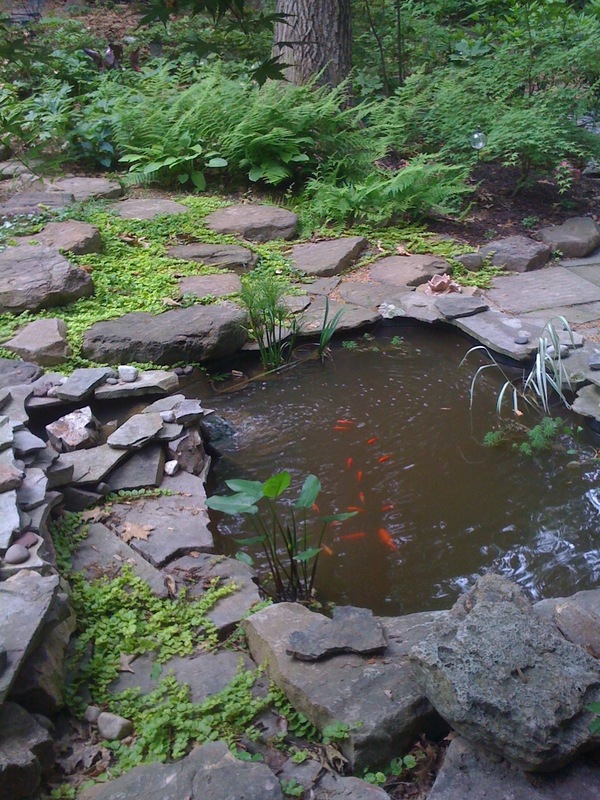 What other steps do you take while readying your pond for Spring? Post a comment and let me know! An avid gardener and owner of this site. 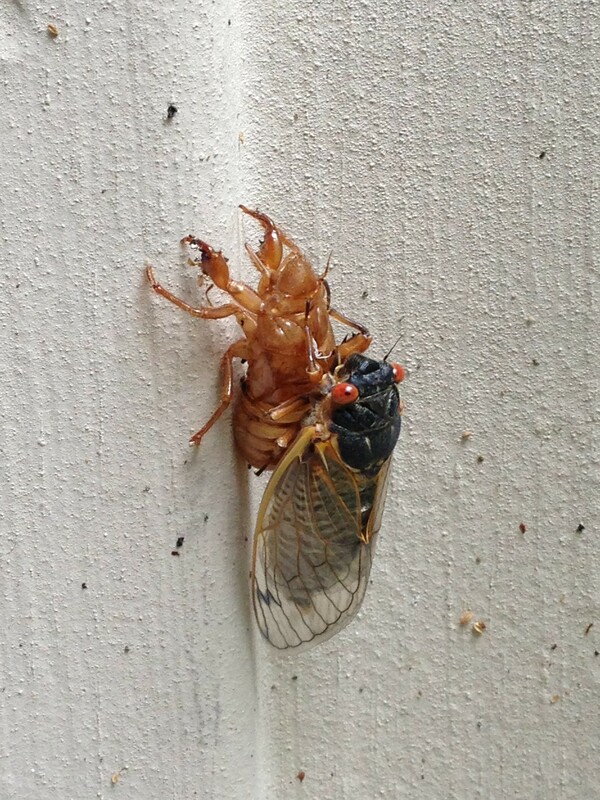 Cicadas – Friend or Foe?